Say bye bye to the filing cabinets and those stack of receipts! Take a picture of the receipt with your phone, or upload, and I will allocate the purchase in the accounting software. Email your paperwork, we will take care of the rest. 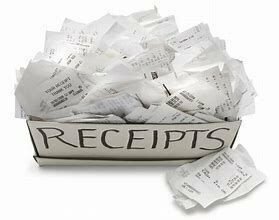 Be gone receipts! Yes, that simple. An "audit trail" is necessary. For starters, it helps you the client to prepare for an audit. It is vital that all accounting source documents are filed in such a way that they are easy to retrieve at a later date in case of any queries that might pop up. All your business-related documents in a central location, you can share, manage, and access those documents from anywhere that has an internet connection.